This site is devoted to providing historical stock info for de-listed stocks because most of these companies no longer exist and information on them is scarce. As a result, you would need to get this information if you were to sell stock that was originally purchased in an older company that is no longer active, because the ownership has been passed on to successor companies. 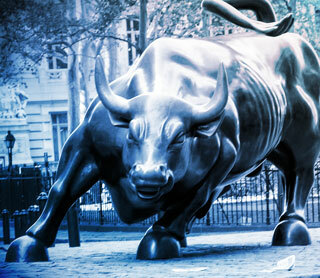 For income tax purposes, you need to determine cost (technically called basis) in the stock sold in order to compute a capital gain or loss in the stock. Therefore, in addition to historical stock quotations you need to know corporate changes such as stock splits, acquisitions and spin-offs, etc. in order to properly account for your cost basis. We split the site into two major areas. 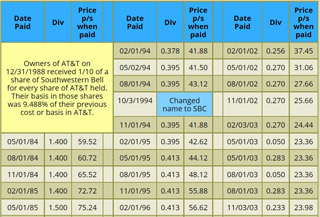 The original categories that provide historical stock info on Sears, ComEd, Mobil, and 1st National Bank of Chicago and then the Baby Bell Page. Consequently, people need information on the Regional Bell Operating Companies (RBOCs) which were created January 1, 1984 when The Justice Department broke up AT&T up into itself and 7 new regional companies. People commonly referred to them as the “Baby Bells”. When you view a “Ref-Sheet” for a given company you will see corporate actions, and a chart every dividend paid by date and the corresponding price per share on the date of the dividend. 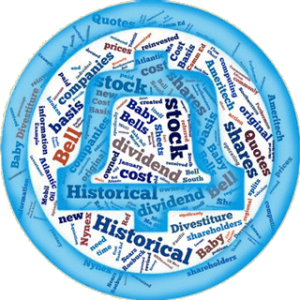 This historical stock info is essential, since most Baby Bell stock held was held in a manor as to reinvest dividends. We liked the Ref-sheet idea so much, that we decided to have a ref-sheet for all companies on our website, not just the Baby Bells. 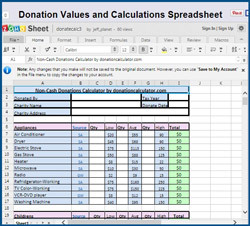 At donationcalculator.com we provide an interactive spreadsheet to find, calculate, and document the value of clothing, household goods, furniture, appliances and other non-cash items donated to charitable organizations. Donation values were obtained from the websites of Salvation Army, Goodwill, and other various charities. Due to the popularity of our recent charts for Airtouch, NCR, Lucent, etc. We have decided to create a new site dedicated to creating visual cost basis charts. Besides some of the companies on this site we have added other companies that you may be interested in. 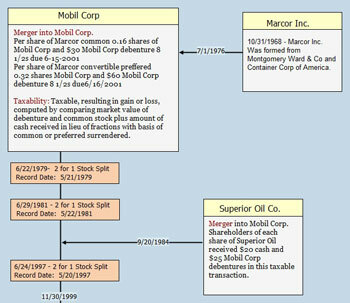 Some of the merger and spin-off corporate actions are very complicated and hard to follow by word, We believe that by putting them in a chart format it will make them more understandable.